Good Evening and I hope you all had a fab Christmas and are gearing up for the New Year celebrations! The DT have noted that many people have not shown their older card so to qualify for a prize you need to do this. Onto winners from previous challenges! There is a tab at the top of the page for winners and top 5, these are now posted and will be announced every 4 weeks in the new year so go check and see if youre a winner! Hope you all have a great new year, watch the hangovers lol! Good Afternoon!! We're having very special challenge here at Crafty Cardmakers for the next 4 weeks and its something a little bit different and a lot of fun! We've also managed to pursuade the sponsors or their representative to join in the fun :) Its a very long post with lots of advice and tips along the way and its to wrap our year up and see us into 2011! We're gong to be saying goodbye to Corry and Kat after this challenge so thanks very much for the last 6 months girls you will be missed! Any outstanding prizes will be announced on the new winners page (see the link above) as we're still waiting to hear from a couple from previous ones. Our Spotlight on Tags is still running for another week if you fancied having a go at that. We'd like to see your LATEST OR GREATEST creation so anything you like or a particular favourite AND here's the important bit, we'd also like to see your FIRST or the OLDEST one you have a photo of! I can see you cringing and thinking oooooh nooooo mine's really baaaad! Don't worry, we ALL started somewhere and I hope you can see from the samples that everybody was new once and with a bit of practice you can get better and you'll also see how much you've already got better by digging out your first efforts! You can enter up to 3 times but each must contain a picture of one of your first designs and must be different techniques or items e.g. 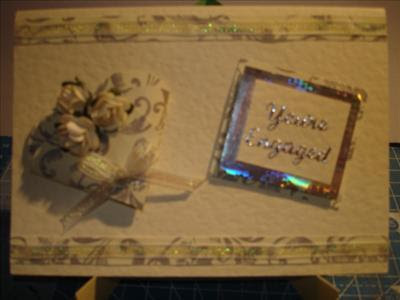 first card, first stamped card, first scrapbook page, first tag etc. They must also be separate posts. You can enter your latest creations or your favourites previously published alongside your old design. You can enter in as many other challenges as you wish but many challenges do not accept older creations so just be mindful of that. 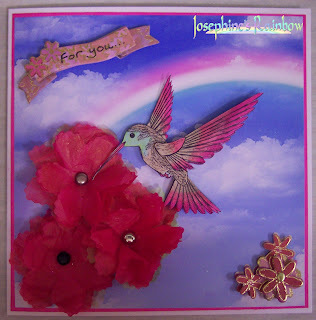 Please link back to this blog and mention Crafty Cardmakers in your post. We are very proud to be sponsored by a number of very kind stores for this challenge with lots of winners for this one and also some wonderful well known guests so you can see exactly how they started and be INSPIRED! Please take the time to have a read of where we all started and where we're at now as you never know what might spark an idea off! Joanna Sheen is offering a £10 voucher for her online store which is packed full of goodies! Representing Joanna Sheen is the talented Suzanne and here are Suzanne's first and favourite. The Cracker that started it all! I have always been into crafting from as young as I can remember and starting card making through mounting some cross stitch work into a card to give to a friend but love making different crafty projects too. From my earlier cards I began to learn the joy of making each card something special and I now take so much more care with each card or project I create. I was shocked not knowing Joanna at the quick reply and she loved it , I was so pleased I set about making 3 cards up from the cd which weren’t Christmas cards to show its versatility as Christmas was just passing by this time and sent them to Joanna – at this point I didn’t know that Joanna had a team of sample makers . I just did it for fun as I loved my new found hobby of cd crafting, having never done it before. The Romance cd came next and I was asked to make some samples up , which I was honoured too and nearly 5 years on now I’m still proud to be a part of Joanna’s wonderful design team. Being sent projects monthly is such a joy and I love every minute of it. I took a 5 year career break from my retail management job to have my daughter and last year I had to make the decision to find more work or return to my job. Whilst posting my samples on my blog I started doing daily workshops just for fun and to try help inspire people just starting out, then I saw a piece on Sheena Douglass’s blog saying demonstrators needed and it gave details of how to apply. It was something I could commit to as I had a 5 year old to care for, but I wrote to the director of Creative Expressions and submitted detailed plan to start online demonstrations so that a wider audience of people who couldn’t’t travel to places , or worked different hours or just couldn’t get out could still see the workshops. A few meetings later I started weekly online workshops which I have now been running a year and I’m proud to say I have also had my smaller cracker template idea made into a kit form through Creative Expressions. This all started from me making a sample or a pick of the day project with Joanna. So now I have the best job working with Joanna & Creative Expressions whilst having the time to care for my family too. I have run The Stamp Man with my partner Ian for over 20 years. During this time we have maintained a retail shop and operated a mail order service. We have had shows on Create and Craft TV for over 7 years. 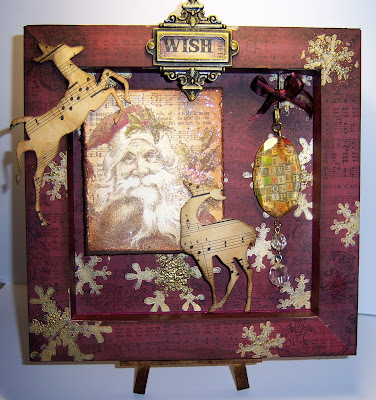 As well as our main blog where I show my own work, we have a fortnightly challenge blog and a monthly ATC blog. 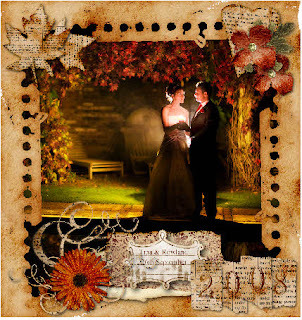 We have an excellent design team of ladies that contribute to the themes on these. A number of them also regularly contribute projects to craft magazines, mainly Craft Stamper. I don't have the first card I ever made to show you, but it would have been simple and embossed in gold, as that was what I started with, colouring would have been with brush pens or water colours. The earliest card I can find is one I made around 9-10 years ago, it was the first card I made with Moonshadow inks. Over the years I have made many cards/altered projects that have appeared in magazines but I do not have photos of them so one of my greatest projects here will be the clock card I made for Ian's birthday this year. Stitchy Bear Stamps is offering a $10 prize to spend in their online digital store with a huge variety of artists under one roof! 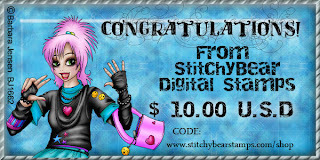 Representing Stitchy Stamps is Brenda! Designing, creating and making things has been a part of my life for as long as I can remember, but for many years I just didn’t have time to explore my artistic side as work and my family took up all of my time. Now I work part time and my children have grown up I have really begun to have fun playing with all sorts of media and learning new techniques. In the past I have loved teaching children art and have developed sketching and book making. 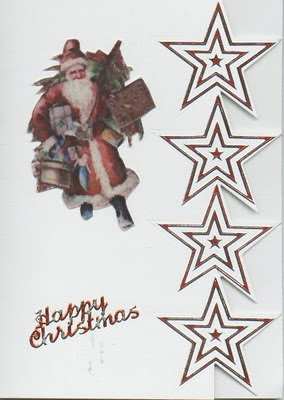 I have also made some cards over the years but they were only when I could find time so my skills really didn’t improve, until January this year when I discovered blogland and wow – since then I haven’t looked back. In January 2010 I started my own blog and I have been sharing my work with whoever wanted to stop and have a look. In May I was asked to be a guest designer for One Stitch at a Time challenge blog, I so enjoyed the experience I decided to join some design teams. I applied for three and got accepted to all three which really boosted my confidence. Currently I am DT member for One Stitch at a Time, Moving Along With The Times and The Stamp Man. I have had a number of wins and Top 3 successes with my creations and I really enjoy the challenges as they help to stretch my thinking and creating. 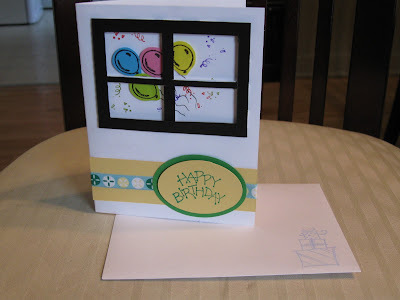 I hope you enjoy this challenge at Crafty Cardmakers. I love the saying “Life isn’t about waiting for the storm to pass, but about learning to dance in the rain”. Enjoy your dance, have fun learning and creating and above all remember there are no mistakes just learning opportunities. 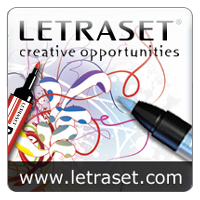 Letraset have a 5 pack of promarkers up for grabs and are represented by Debbi Glennie. Hi everyone, I’m Tracy from Crafteezee. I have been married to my understanding Husband for 24 years, yep next year’s the big one, and I have two lovely children, Jade who is 18 and my son who is 15, I know I don’t look old enough, lol. Nicky from Stamping All Day's first and favourites. Since those early days ... I have become much more discerning in my tastes ... I still like to experiment with lots of different product which makes my style ... eclectic ... if that is indeed a style... and since that first stamped card ... my hobby has evolved into the way I make my living! I am a Ranger girl at heart and love nothing more than trying new things and getting inky and messy ... the highlight of 2010 for me was attending Ranger U. I teach regular workshops in the UK at L.B Crafts ... 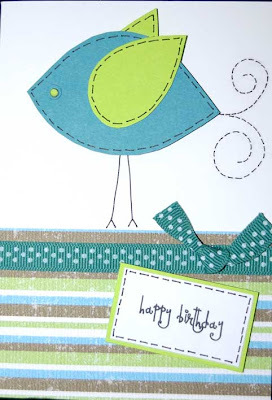 I am currently a Design Team member for Zutter; Craft Stamper Magazine; LB Crafts and Simon Says Stamp. I have also just returned from a weekend of teaching in Paris at the Paper and Co Show. My advice for anyone starting out is don't restrict yourself with "I Can't" ... Give everything a go ... you just never know. And of course the Crafty Cardmakers Design Team! Oh dear, how embarrassing! 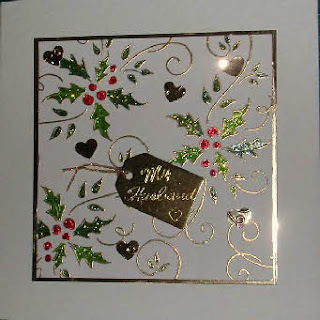 This is my first ever card... it's a stamped one, but I didn't really get into stamping until I'd been cardmaking for a year or so, and this was made with my one and only stamp. The image was coloured with sparkly gel pens, I used holographic paper which I seem to have been a bit obsessed with when I first started. The other papers were just wrapping paper I think. It's very pink isn't it?! 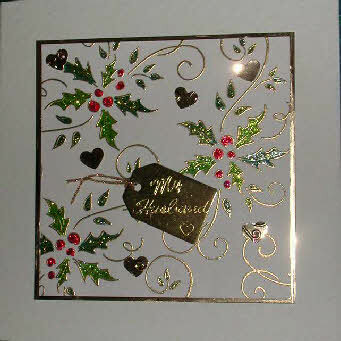 I started cardmaking in 2007 and I blush to think of some of the efforts I must have given people back then! Crafty Cardmakers was my first DT position, and I'm currently on the DT at Little Claire Designs, Di's Digi Downloads, Digistamp Boutique (GDT) and Stamp Something. My most recent card is one I made as a sample for Little Claire. The image is coloured with promarkers and koh-i-noor pencils, papers are MME, and the flowers and button are from my stash. Oh I've been crafting since I was at school, over 15 years now all THANKS to my auntie Evelyn that bought me my 1st wee kit! My obsession has grown and grown form a shoe box full of stuff to and 3 drawer unit and now and entire room bursting at the seems! I started my blog just over a year ago and have never looked back! My Mum and Grandparents still have all the cards I've ever made them, not sure that's a good thing hee some are from when I was really young ........... crayons and glitter!! The engagement card is about 8 years old and one of the earliest pictures I have of my 1st creations! The easel is the card that I made for my Hubby's Christmas card this year! Details on my blog! 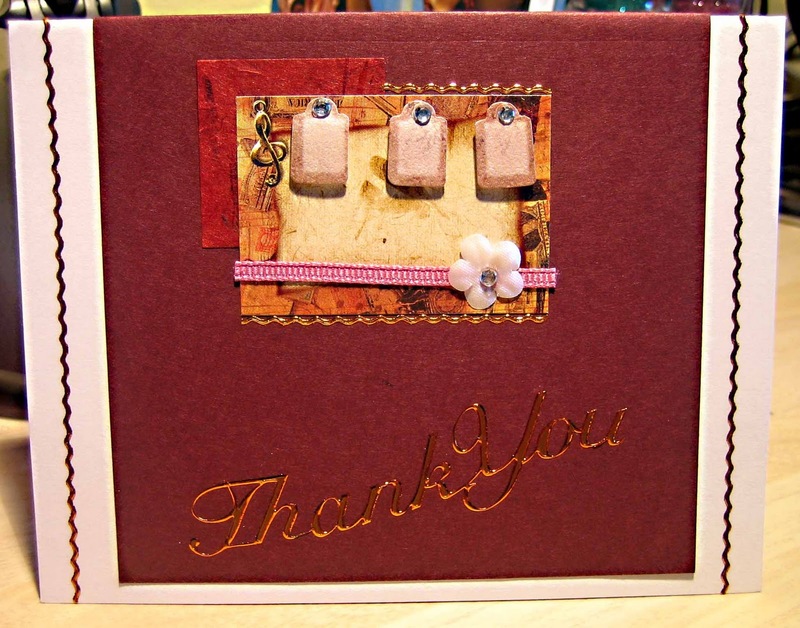 I'm so proud to be part of Crafty Cardmakers and all the friends I have found! Crafting is for life and something that just takes over hee!! Oh boy...April 4, 2008-first card- I remember making this card for one of the first SU card classes I went to. Only a couple no name stamps in hand. Task was to make a window frame.I was so very proud of this one. LOL. Since this class I have fallen deeply into the addiction abyss of crafting & blogging. I started my blog inMarch of 2009 on the advice of my BFF the Prairie Fairy, as she was about to launch her digital images....more details of the facts in between SU stamps & digital images to be found on my blog. December 10, 2010- latest creation- EXPLOSION BOX. I've been wanting to make one of these for some time & I figured, why not make it for the Craftiest Blog I've had the pleasure of being a part of! Again, the entire explosion can be found on my blog. 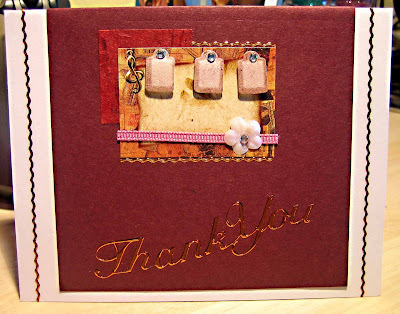 I have had a great time serving on the the Crafty Cardmakers DT with the likes of some extremely talented ladies & this is a fond farwell to each & every one of them!! 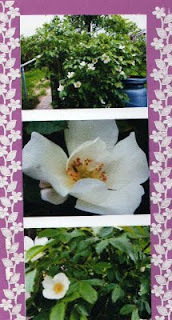 I am Joy A. a 75 year old Recycled Teenager who started making cards several years ago using both the Microsoft Greetings & Publisher programmes, but changing the pictures on them or just making cards without any pictures and putting these on later. 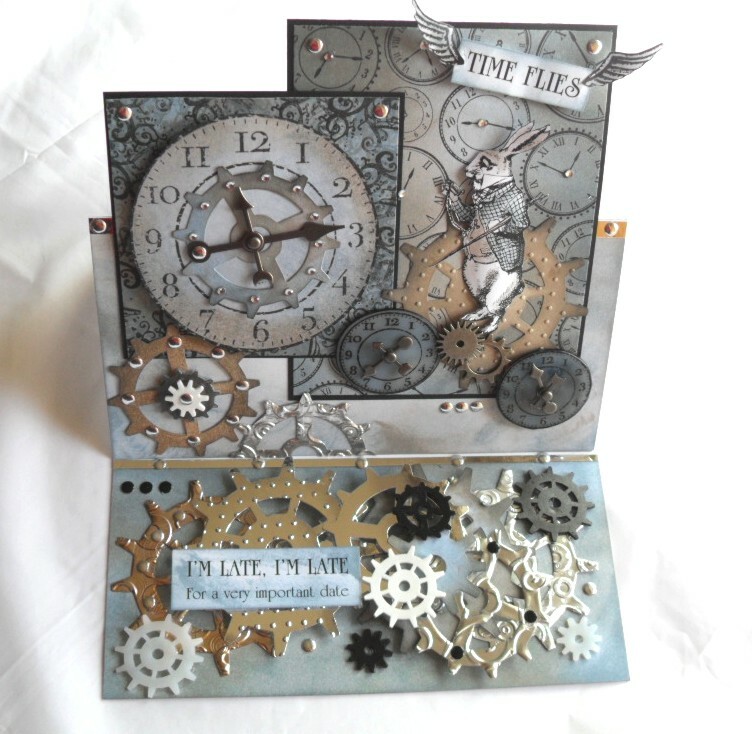 Then I bought a couple of card making kits which I enjoyed using, and joined the CraftyCardmaking group and slowly & surely my cards improved. I enjoy using Peel-offs & colouring them using watercolour pencils, and also like to try different methods which I am doing thanks to the help I receive from other members of the group & members of the DT here. And this is my latest card. It is a Christmas card for a friend who really inpires me. 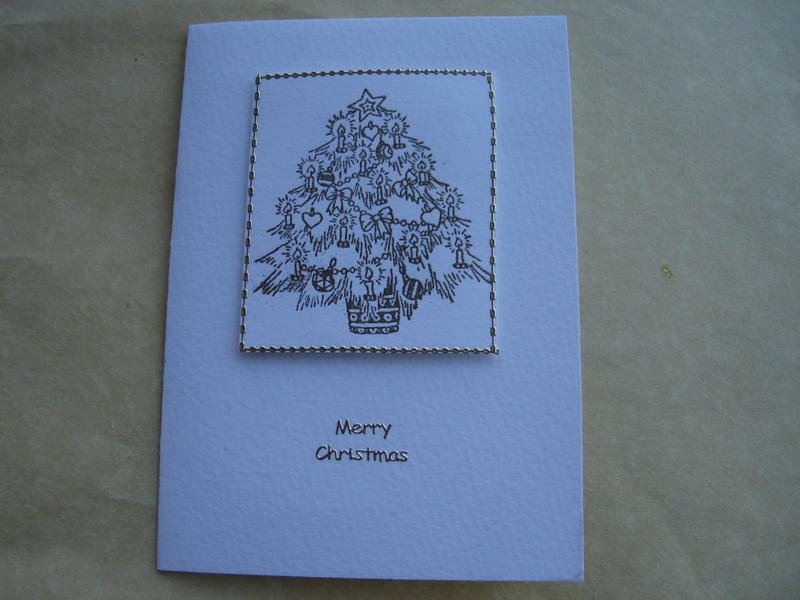 I resisted making cards for ages but eventually was persuaded to start by my late and much missed Mum who made her own cards and suggested it might be a cheaper to make my own rather than buy Christmas cards! Oh Mum, what did you start, LOL. 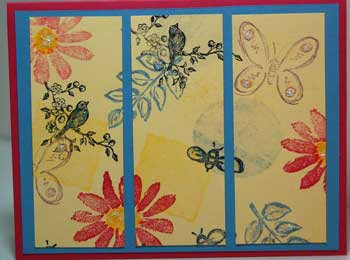 I quickly joined a group run by the fabulous Vix who encouraged me to explore rubber stamping. Now I feel I haven't made a proper card unless there is a bit of ink on it somewhere. I LOVE rubber stamps. As for style I seem to make both the cute type and arty (and everything else in between, but have to admit to being pretty useless with digital images apart from print. I have started to enter a few more challenges this year and had some success. I was particularly proud of having cards chosen by Play Date Cafe and Gingersnap recently. This is the only DT I am currently on but hopefully when I am more organised in the New Year I shall look into joining a couple more. I've been making cards for quite a few years, but switched from 'stitched on cloth' to paper based about three or four years ago. In that time, I've tried a lot of different techniques, and learned a lot from people in the crafting community. This is an early 'paper' card. And a more recent one! I'm on one other design team - One Stitch at a time - and enter challenges most weeks. So far, my achievements are a couple of top threes from this blog (before I was on the DT), one from Pollycraft and a top five from Passion for Promarkers, but I do enjoy the challenge of coming up with something a bit different every time. Made from cut outs from a tissue box, holographic pink card, peel off hearts and butterflies, netting, mulberry paper and a tea bag rosette (I think I wanted to throw my entire collection of stash on one card!) I started making in 2003, playing around with most techniques. Since then I've won a category of cardaker of the year (CM&P), won twice at crafts beautiful (£100 prizes), numerous blog prizes, have been published in Craft Stamper & Papercraft Essentials, am on 5 design teams including The Stampman, Crafts & Me and Passion for Promarkers and I write occasional tutorials for Letraset. I'd say I really got much better in the last 2 years or so when I started entering challenges on blogger and finding promarkers clearly helped! And my latest below which is an image from Crafts & Me called the butterfly keeper, I love colouring faces and hair. I've used promarkers and sakura stardust pens, starburst stains from Stampman which I've embossed with the divine swirls folder on the cuttlebug and the cute little text tag from Stamping All Day. 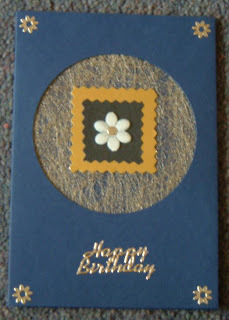 My first attempt at cardmaking in July 2009 when I had virtually no stash was a 10th Anniversary to my fab hubby! Whereas my latest attempt is a Christmas card where I have used a digi backing paper, a rubber stamp, nesties, distressing, Promarkers, glitter....I can't believe the improvement and have to put it down to blogging and meeting other fabulous crafters who are happy to share ideas and tips. 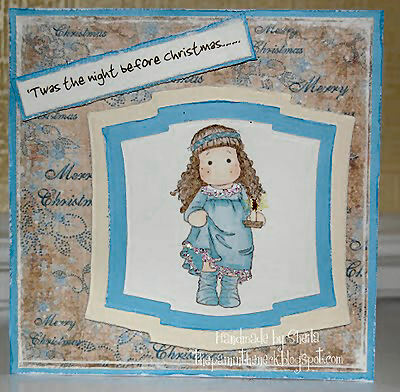 I am now on 3 design teams too - this one, Cardmadfairy Creations and Fairymoon Crafts. I have to say that this latest card for me is totally out of my depth as I once said I would never use 'one of those stamps without a mouth' (thought they were abit creepy - sorry) - but I have now fell in love with them! Here is the first card that I ever made,OMG how embarrasing lol .My mindframe was obviously just "stickers and a strip of paper and Bobs your uncle" haha This was 2 years ago. 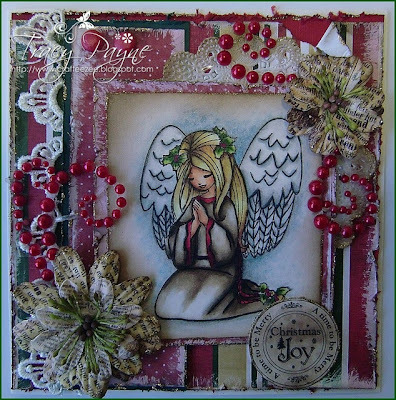 And this is the last card that I have made, my last Christmas card...so i thought lol until I got an order for 10 more :o( The stamp is from Kanban and the papers are from one of last years Papermania collection. I have used a Martha Stewart snowflake punch and also a Papermania Punch for the 2nd layer of the snowflake. I started Cross stitching in 1986 after taking a newly bought copy of Cross Stitch magazine on a coach which had a little duck on it and have been making cards ever since. I moved towards papercrafts in 2002 after visiting the Stitching show at the NEC, seeing a demonstration on cardmaking and thus began the obsession! This is the first card I made using peel offs of course. The material were so basic that were available then it is amazing how much has changed really. Since cardmaking I have had a few cards on the reader pages of some magazines, won a £100 worth of Paper Cellar goodies from Crafts Beautiful, and won some prizes on blog challenges. I have been on the Guest DT for Di Hickman, Card Sketch a Day and Sketches by Tamara and of course the lovely Vix said yes when I asked about being on the DT for Crafty Cardmakers. Here is my first ever card, which would have been when I was about 5 I think! 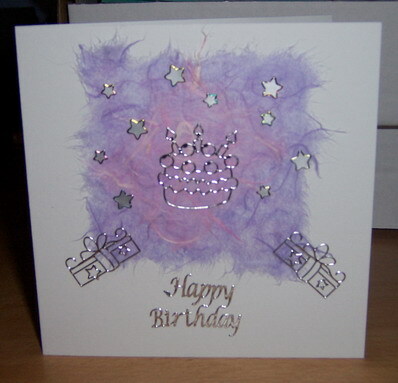 And my most recent card which I made with a digistamp from Stitchybear Stamps entitled Birthday Boy. I have been crafting for most of my life in one form or another. My Gran taught me first french knitting with a cotton reel and nails and later knitting and sewing. Due to poor health I needed a hobby and started papercrafting in 2005. 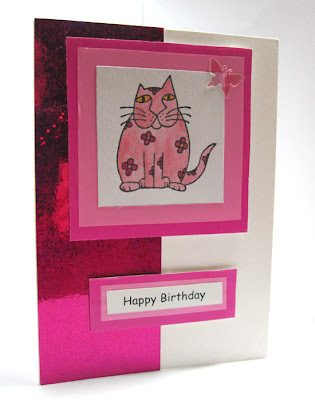 Since then I have gradually fallen in love with cardmaking. In April 2009 I started a blog and haven't looked back since. I have won a couple of blog awards and a few challenges, which started with my first ever challenge entry winning a set of stamps, at which point I was hooked on blogging too. I was on Crafty Catz CDs design team in the early part of this year, but CD crafting is not really my thing. 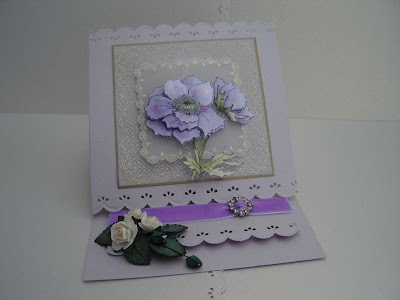 In June I was thrilled to be chosen by Vix to be one of her newly expanded Design Team for the Crafty Cardmakers Blog. A couple of months back I was even more amazed to be head hunted by Sheena Douglass to be a founding member of her Design Team for her new solo venture after she left Creative Expressions. I recently won first prize of £100 in the Crafty Computer Paper 2010 Competition in their Paper Crafts section for some jewellery I made with shrink plastic. Like many of the other girls I've been crafting in one form or another for as long as I can remember but I started making cards on a regular basis when my youngest son was at playgroup (he's 15 now) and I remember taking a box of cards in to show the other mums my Mother's Day creations and having them snapped up there and then. Well that really got me going and when I think back to how simple and unsophisticated they were it makes me blush that I asked for money for them! Unfortunately I didn't take photos of any of my early cards and it wasn't until I joined an online forum and wanted to start sharing my work that I began to record what I was making. The first card that I uploaded to the forum was mid-2008 and as you can see I wasn't very good with the camera back then. My latest card is a Christmas card finished today, using a digi stamp from Stitchy and I have had to scan it as I ran out of daylight before I could take a photo. I've been making things since primary school - knitting, crochet, tapestry etc. Like many people I know my first cards were cross stitch. 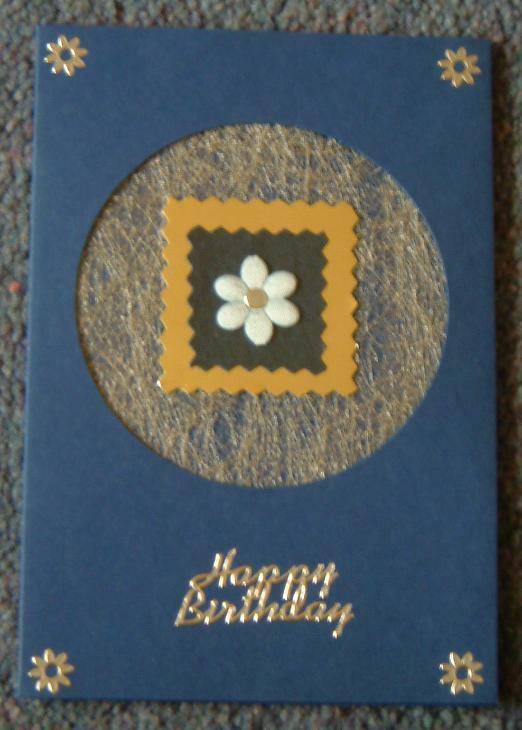 I first went to cardmaking classes in late 2006 at a local craft shop. 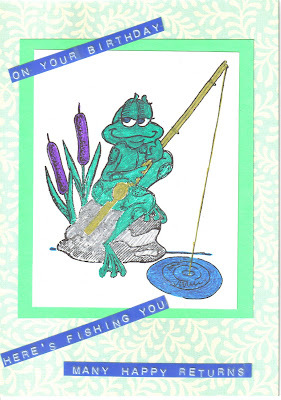 The photo of one of my first cards predates the classes. I went to a paper mill at Aberdeen with the WRI and someone was giving a class. We watched fascinated and she said some of us could have a shot. So this is what I made. In my defence it was not my design - I just did what I was told to do! This is one of my latest cards. My boss's Mum loved the card I made when her great-grandson was born. So I made a Christmas card for the baby for my boss and this is the one I made for her Mum. Details on my own blog. When I made my first card I thought it was awesome. Years latter and I'm glad I never mailed it. It does make you feel good to see your progress. I have been cardmaking for over four years, but became more into it in the last two. I really enjoy working with digital stamps and Coloring in with Copic markers. 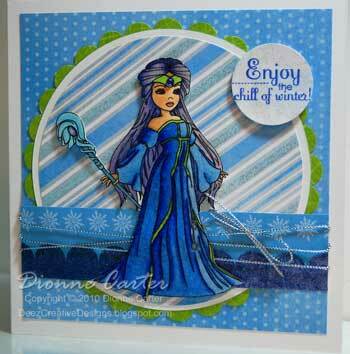 This image is from Stitchbear stamps called Ice Princess.